This breed was named for King Charles II who was quite "cavalier" about his royal duties because he was too obsessed with taking care of spaniels! The CKC are well-known for being lovable, affectionate lap dogs — though they’ve also been known to retain a bit of that ‘sporting dog spirit’ they were bred for, and do tend to go off in a flash to chase god-knows-what. 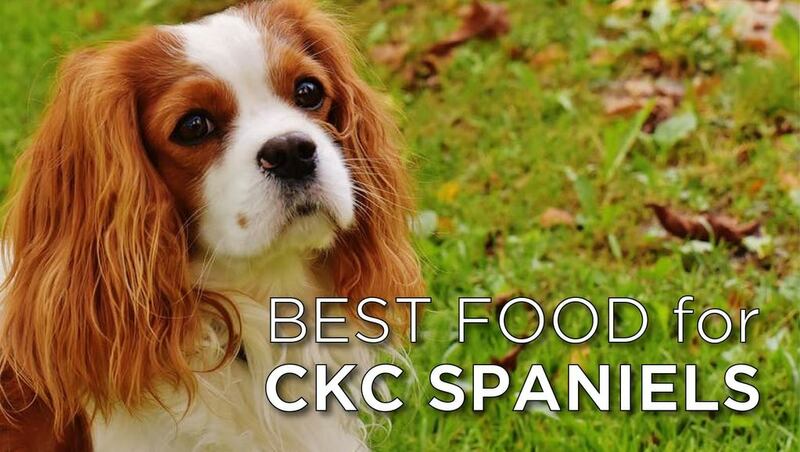 But what’s the best dog food for Cavalier King Charles Spaniels? We’ve actually done a ton of research about this, seriously. Here's we came up with! **There's more info below, but you can also click the links above to see current prices or read customer reviews on Chewy and Amazon. So, What’s The Best Dog Food For Cavalier King Charles Spaniels? 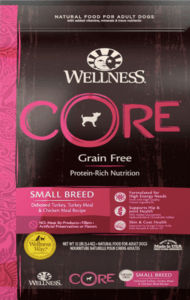 We’ve done a lot of research on this topic—and while there are a ton of awesome food choices on the market nowadays, we really felt that Wellness Core Grain Free Small Breed Original Formula simply stood out from the rest. With some hereditary weaknesses, the Cavalier requires a diet that’s rich in vitamins, minerals, antioxidants, probiotics, and amino acids. This dog food really seems to deliver on the nutrients that the Cavalier needs the most. It’s grain free, contains Omega Fatty Acids sourced from Salmon Oil, and comes loaded with antioxidants, botanicals, probiotics, and even Glucosamine. It also contains essential vitamins and minerals like zinc sulfate, copper proteinate, taurine, vitamin D3, folic acid, and many more—all of which are extremely beneficial for the Cavalier’s unique health support needs. If you’re looking for an awesome, natural, nutritious dog food that’ll help to keep your Cavaliers going strong, then we definitely recommend that you give Wellness CORE Grain-Free Small Breed a try. It’s packed with most of the amazing nutrients that Cavaliers need, and deficient of most of the fillers, grains, corns, and soy that they don’t… making it a dog-food formulation that seems almost perfectly suited to their unique needs. 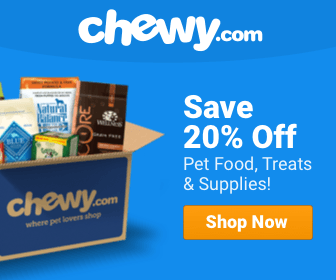 How Many Calories Does A Cavalier King Charles Spaniel Need? As a smaller companion dog, the Cavalier tends to grow to about 1 foot in height (at the shoulder) and 13 to 18 pounds in weight. This is a dog breed with pretty simple exercise needs. They enjoy a daily walk, but tend to tailor their physical activity to the habits of their owner. Aside from being a bit on the ‘active’ side when indoors, this dog is pretty easy to care for. A less active Cavalier will need about 400 calories to stay fueled and energized throughout the day—while a moderately active dog will require a bit more—somewhere closer to 500. If your dog tends to be highly active, then you may find yourself feeding him or her somewhere in the ballpark of 800 calories a day or more—depending upon his/her exact weight and exercise schedule. Looking for More Information About This Dog Breed? Cavaliers are unique in that they seem to possess some inherent hereditary weaknesses. They are pre-disposed to several very dangerous and progressive health problems, and feeding them a proper diet is essential to their happiness, health, and well-being. A diet that will strengthen their kidneys, heart, liver, and circulatory health is the most beneficial, as these are the areas that seem to need the most assistance where diet is concerned. A diet that contains plenty of real meat protein and vegetables will probably be the healthiest choice for your Cavalier. Feeding a grain-free dog food is also a must, as it will help to keep carbohydrates to a minimum. Make sure to monitor your Cavalier’s caloric intake as well, as this breed can be very susceptible to obesity. A dog food that contains probiotics, fruit, organ-meat, digestive enzymes, antioxidants, and fiber is probably going to do the most good. It’s also important for your Cavalier to get plenty of the right vitamins and minerals. Some of the most important of these to supply through your dog’s diet include copper, zinc, vitamin D, iodine, folic acid, and taurine. Cavalier King Charles Spaniels are actually pretty healthy dogs—though, like any breed, they can be susceptible to a number of different diseases and conditions. You can save yourself a lot of trouble by buying your dog from a reputable breeder. Try to choose breeders who test for all of the most common genetic diseases, including Episodic Falling Syndrome, and make sure to ask a lot of questions before ordering your puppy—just to make sure that you’re not getting a dog from someone who doesn’t know how to properly raise and socialize it! At any rate, here are some of the most common conditions that can arise within the breed. Not all King Charles Spaniels will end up with these—but it’s good to be aware of what could potentially go wrong. This condition, also known as MVD, is unfortunately common among King Charles Spaniels. Basically, this problem starts as a heart murmur—but it eventually gets worse and worse until it ends up causing heart failure. They can actually end up with this disease at a pretty young age (1 to 2 years of age), so make sure to schedule regular vet check-ups throughout the life of your pet—so that you can keep an eye out for it. Dietary salt restrictions might help a pet with MVD or some other form of heart disease. There are also some drugs that can be used to help treat dogs that have been diagnosed with the condition. Check out this article for more information. This condition, to put it in basic terms, occurs when a dog is born with insufficient room in the back part of the skull. This causes the fluid that surrounds the brain to be forced through a smaller-than-normal opening into the spinal cord. This is an inherited condition, and is becoming more and more common in Cavaliers. Some symptoms include excessive scratching around the ears, general pain that doesn’t seem to come from anywhere in particular, and a weakness in one or more limbs. Dogs with this condition might experience relief when treated with anti-inflammatory drugs—but surgery is usually required for more serious cases. 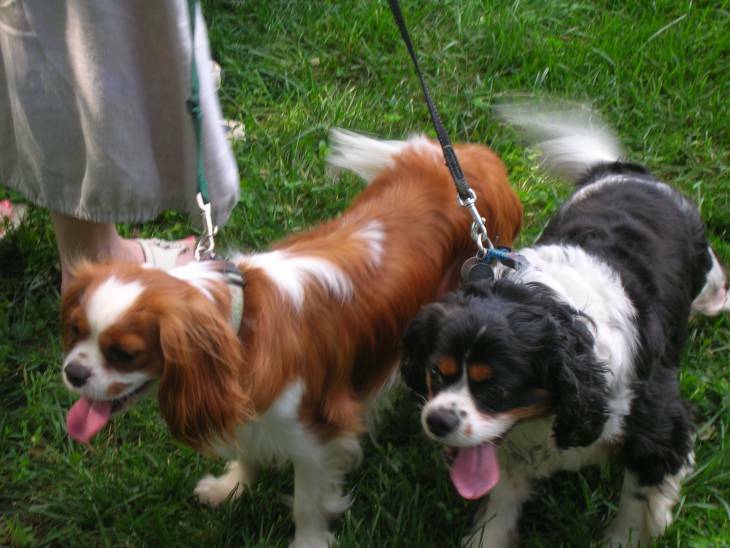 For more information on the disease, check out this article, published by the Cavalier King Charles Spaniel Club. This is a rather unusual, seizure-like affliction that affects Cavaliers—though exactly what causes it is still not known (other than the fact that it can be detected with a DNA test and is passed down through the genes). Since the causes aren’t known, it’s difficult to say what you should or shouldn’t do to alter your dog’s diet if he or she ends up developing symptoms—though everyone seems to agree that feeding a high-quality diet that contains plenty of vitamins, minerals, and healthy protein is essential. Most good breeders leave the weaning process up to the mother—allowing nature to take its course. In fact, some people say to watch out for Cavalier breeders who try to wean their pups too quickly! Cavalier King Charles Spaniels can sometimes nurse until they’re 10 to 12 weeks old. If at all possible, try to keep the pups nursing and close to their mother until they’re at least 8 weeks old. Separating them from the litter before then can jeopardize their future ability to adapt and socialize with new pets and humans. Cavalier King Charles Spaniels can sometimes nurse until they’re 10 to 12 weeks old. Cavalier puppies tend to weigh about 4 pounds by the time they’re 12 weeks old. 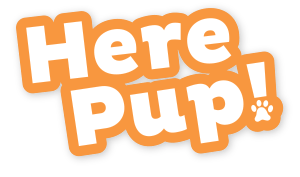 Puppies will require about 170 calories per day to stay fueled and energized at this point, though this could also vary by puppy, energy level, and actual body weight.